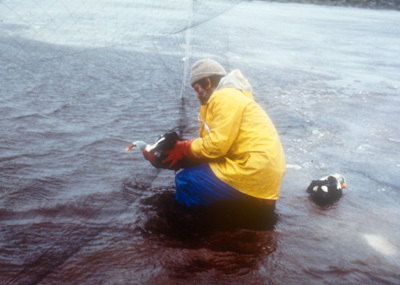 During the period between February 17 – 20, 1996 numerous reports of oiled birds beaching themselves on the shores of St. Paul Island in the Pribilof Islands began to come in the the US Fish and Wildlife Service’s (USFWS) Alaska office. While no spill incident had been reported nor oil slick identified, the numbers of oiled birds prompted an investigation by USFWS biologists. By February 21, International Bird Rescue Research Center (IBRRC) was notified that there were several hundred oiled birds on the beaches of St. Paul Island. 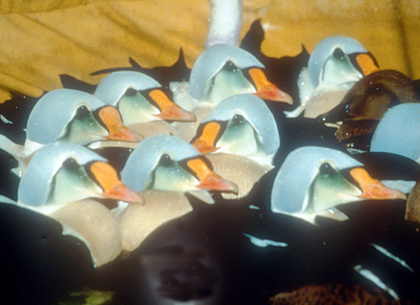 The majority of these birds were King Eiders (Somateria spectabilis ), a large northern seaduck that winters in the waters of the Bering Sea. During this time period, these birds were moving into their breeding season and the males showed their spectacular breeding plumage. Later is was determined that the M/V Citrus spilled bunker-C fuel oil into the surrounding island areas. The Pribilofs are a group of small, rocky islands set in the Bering Sea approximately 750 miles southwest of Anchorage, AK and north of the Aleutian Island chain. Also known as the Seal Islands, for the large population of fur seals that breed here, the two largest islands in this group are St. Paul and St. George. 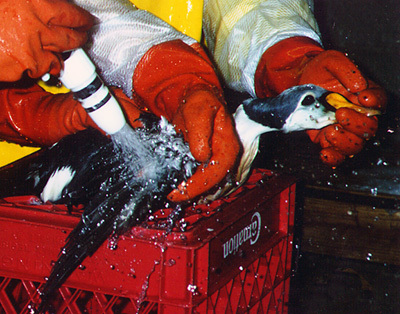 Many species of seabirds breed and reside in the Pribilofs and are vulnerable to the effects of an oil spill. Three members of the IBRRC response team arrived in Anchorage the evening of February 21, 1996. At that time, two common murres ( Uria aalge ) had already arrived at the Alaska Wildlife Response Center (AWRC) in Anchorage from St. Paul island. The AWRC is maintained by IBRRC for the purpose of oil spill training and response in the state of Alaska. It is jointly funded by Alaska Clean Seas, a spill response organization, and Alyeska Pipeline Services, a cooperative of some of the largest oil production companies in Alaska. Because IBRRC had been notified that there were perhaps two to three hundred oiled king eiders and other birds on the beaches of St. Paul island and many more in surrounding waters, two IBRRC response team members left for St.Paul on February 22. These two response team members, Curt Clumpner and Ken Brewer, were to be on site to conduct search and collection once USFWS finished their assessment and determined that it was necessary to initiate a full scale spill response. In addition, they were to assess facilities on St. Paul to see if any of them were suitable for conducting the entire rehabilitation process for these oiled birds. Because no adequate facilities were found, the decision was made to capture and stabilize the birds on St. Paul, then fly them to AWRC in Anchorage for the remainder of their rehabilitation. An important and noteworthy point is that the transport of these birds from St. Paul Island to Anchorage took up to six hours per trip and went very well. Commercial airline flights were available between St. Paul and Anchorage on a daily basis except for Sundays and weather permitting. The actual flight time was three hours. Once the birds are caged and ready for transport they must arrive at the airport up to two hours prior to the flight so that they can be loaded with other cargo. The animals are gavaged just before they are caged and are immediately rehydrated once they arrive at the AWRC. The birds seemed to handle the transport without much additional stress. During one flight, an IBRRC staff member was able to assess their behavior by entering the cargo area in mid-flight and observe. Most birds spent their time sleeping and there was no indication of any escape behavior. During the return Dark areas help to reduce stress in captive wild birds. During the flight they were kept in a dark holding area that is ventilated and heated. The return flight was equally well coordinated and all birds were released in calm and healthy condition. Once IBRRC team members were in place on St. Paul, it was obvious that many of the beached birds from the initial estimate of 200 to 300 birds were already dead after being eaten by Arctic foxes. Oiled birds were being found in all locations on the island, with the majority on the leeward side of the island. By Feb. 25, an estimated 1,000 oiled birds and carcasses were present on the island with 500 carcasses already collected. At this point, there were already 29 birds that had been sent to AWRC in Anchorage. During the next week, another 157 live birds would be collected, though not all of these birds were oiled. While most of the birds were netted by hand, the use of mist nets and spotlighting the birds at night also enabled more lightly oiled birds to be captured. 144 of the collected birds were king eiders but other species such as old squaw, common murres, crested auklets, red-faced and pelagic cormorants and pigeon guillemots were also represented. Bloodwork taken on admission to AWRC revealed that while very few of these birds suffered from anemia, many had very low total protein values, presumably from malnutrition. Remarkably, out of 31 king eiders that presented with total protein values of 1.0 g/dl or less on admission, 21 of these birds survived to release. Once out of the hospital and following intake procedures, the birds were housed in 4′ by 8′ wooden pens that were divided into three equal sections. The pens were raised 2′ off the ground by wooden legs and the substrate was tightly strung cotton netting. This sea bird housing design was developed by IBRRC to protect feathering by allowing droppings to fall though, to provide adequate airflow and to deter the formation of hock and keel lesions. The pens are covered by light colored sheets to provide ease of access, limit injury to birds that attempt to jump up or out, and most importantly to reduce visual stimulus. Birds were housed in groups of 3-6 per section. Floor drains in the area allowed for hosing off of droppings after each feeding and whenever necessary (approximately 6 times daily). Every other day, the birds were weighed, a blood sample taken, and their keels and feet were checked for lesions that are associated with being out of water. This information was used to monitor overall health, to determine individual feeding regimes and to determine when each individual was ready to proceed to the washing stage. Packed cell volumes of 30% or higher, total protein values of 2.0 g/dl or higher, together with weight gains and behavioral criteria enabled IBRRC to determine when birds were ready to be washed. The type of nutritional diet administered was also dictated by these blood values. Birds with a total proteins of <2g/dl received Ensure (Ross Laboratories, Columbus, OH), a human elemental diet which is easier for them to digest in a debilitated condition. Birds with total proteins of >2g/dl but not ready for washing due to low body weight, injury or poor blood values received “Inside” mix. This formula is high fat, high protein and calorie dense. It is used only for birds not housed in water or for birds scheduled for washing within 24 hours. The birds with improved protein level and adequate weights and behavior were started on “Outside” mix 24 hours prior to being washed. This formula is modified and contains reduced amounts of fat. It is not as calorie dense as the “Inside” mix, but it can be used for birds being housed in water. If birds are fed a diet too high in oil their droppings contain some of this fat and oil which rises to the surface of the water and re-contaminates clean feathers . This can lead to compromised waterproofing and is avoided. The three formulas above were administered by gavage. All birds were gavaged three times daily with a rehydrating solution of Pedialyte to avoid dehydration prior to being washed. Once birds were clean and waterproof they had full access to water in the pools and these tubings were no longer required. One hour after each hydrating gavage the birds were tube fed a nutritional diet. All birds were nutritionally gavaged three times daily alternating with the hydrating gavages. The birds were given a two hour rest period after each of these nutritional feedings. Initially, the feeding schedule consisted of up to 900 individual tubings daily. Therefore, although the birds were given a break in between gavages, the staff was going constantly. As soon as the last bird was fed the staff cleaned up and set up for the next gavage and started again. This schedule was intensive and required a staff of three IBRRC supervisors and 6-8 volunteers per shift minimum. The supervisors administered all the gavages and the volunteers assisted with the capture and holding of the birds. Once the birds had progressed to “Inside” mix they were offered whole Night Smelt. These fish where individually quick frozen and shipped from Washington State. Before these arrived we used donated, locally available Hooligan that were a good size, but proved too oily for the pools. For animals that did not readily eat from bowls, individual fish were “bounced” on the net bottoms of the pens to get their attention. With a little work most birds began to self-feed from bowl and tube feedings were lessened accordingly. The fish were provided in clean bowls 4 times a daily and those birds that were not eating from bowls were thrown fish 4 times daily. After washing, rinsing and drying, the birds were placed in one of four large indoor pools. All pools were equipped with “haul-out” areas for birds to climb on for more intense preening or if they have a problem with waterproofing during the night. These haul-outs are rectangular PVC pipe framed netting with floats and were affixed to the side of the pool. Fresh water was constantly flowing through the pools 24hrs a day to provide surface skimming. The water was 32 degrees Fahrenheit and was mechanically softened to a hardness of 30-50 mg calcium carbonate per liter. The water used came from the main at this temperature and this is colder than we usually have access to. The cold water was acceptable to the birds and also aided in keeping the pools cleaner probably because of less fish oil dispersal through the water column. These pools required cleaning a minimum of twice daily. This cleaning was carefully performed with large siphon hoses and scrub brushes. Care was taken during cleaning to not stir up contaminants that were being siphoned from the pool floor. Maintenance of water quality is vital to maintain the birds waterproofing ability. These birds readily ate fish thrown in the pools. Once birds were eating only fish every attempt was made to give one fish to each bird daily that contained a B1 (thiamine) supplement. This supplement was provided to avoid thiamine deficiency associated with thiaminase in frozen fish. Thawed fish was thrown to the birds in the pools every hour from 8:00 a.m. to 6:00p.m. with additional feedings at 8:00 p.m. and 11:00p.m. The increase in scheduled feedings was to facilitate the weight gains towards the release criteria. At this time the male and female Eiders were segregated into different pools. This was done to reduced stress and increase feeding behavior by the females. Once all the birds (131) were in pools we fed out approximately 120 pounds of fish a day, or .9 pounds per bird. The feeding of fish was relatively simple and significantly less labor intensive than the gavaging necessary prior to washing. The fish feeding program consisted of one or more individuals tossing freshly thawed fish by small handfuls towards the birds. The birds became stimulated to feed by this activity and would catch fish at the surface, from each other or dive for the ones that sank. Initially, the birds were stimulated to the point of feeding frenzy with lot’s of aggression and competition. As the birds gained weight this behavior tapered off and feedings were less frenzied. This was also probably due to the birds becoming accustomed to the feeding procedure and schedule. Small amounts of fish were left in the pool bottoms and on the haul-outs. Too much fish left in the pools or excess of fish eaten in a short period of time results in too much oil being dispersed into the pools and this could compromise all waterproofing capability of the feathers. The feedings were closely monitored by staff to prevent overfeeding. Additionally, each bird received prophylactic anti-fungal treatments daily, given at the first and last gavage. This prophylactic treatment is administered as a preventative against aspergillosis (Aspergillus fumagatus) infections. Aquatic species of birds, especially sea birds, have proven especially susceptible to this fungal infection of the lungs and air sacs when in captivity. IBRRC has used this drug successfully in the past to treat species that previously were difficult or impossible to rehabilitate due to aspergillosis infection. The drug used was Itraconazole (Sporanox) by Janssen Pharmaceuticals (Piscataway, NJ) at 10 mg/kg orally twice daily prior to washing. The average weight of the birds in care of each species was used to determine the general dosage. The treatments were reduced to once daily once the birds were in the pools. This reduced stress by reducing the number of times a bird had to be caught and removed from the pool and minimized the risk of capture related injury. Ventilation was also increased when birds went to pools by opening large roll-up doors in the aniimal holding area. IBRRC has found that stress and lack of ventilation are primary contributors to infection. All birds were also treated one time while in care with a vitamin B Complex and iron dextran injection to facilitate red blood cell replacement. Many of the king eiders presented to the facility were passing tape worms and it was decided to treat all birds of this species with one injection of praziquantel (Droncit, Haver/Diamond Scientific, Shawnee, KS) against this parasite to facilitate weight gain and general health. IBRRC was able to aid in the development of the release plan with USFWS. Goals of this plan included releasing healthy birds to optimize their chances of survival in a marine environment with extreme and variable weather conditions, releasing near land and prime feeding areas, and releasing in an area of minimal human disturbance. Release criteria included use of minimal acceptable weights, normal hematology values, normal physical examinations, normal feeding and diving behavior in captivity and impeccable waterproofing. All birds had tarsal and culmen lengths measured by USFWS and were Federally banded prior to release. Birds were flown back to St. Paul island for release accompanied by IBRRC or USFWS personnel. A total of 126 birds were released by March 23, 1996. The survival rate at the completion of this response was 78%. The goal of the rehabilitation effort was to provide proper nutritional, medical and housing needs to restore the animals to normal condition. The success of this response was due to several important factors. First, the qualified and experienced staff which included seven IBRRC response team members at the center and five at the capture and stabilization site. Of additional importance was the large volunteer pool from the community and petroleum industry. Over 150 volunteers were used, of whom a dozen were previously trained by IBRRC and another dozen were Bird TLC volunteers who regularly work with injured wildlife. Another important factor in this rehabilitation program was the effectiveness of the capture, stabilization and medical programs that directly affected the condition of the animals admitted to the rehabilitation program and increased their chance of recovery. Of equal importance was the preexistence of an adequate facility with necessary equipment and supplies. Although upgrades to this facility were necessary during this response, the already operational facility expedited the success or this effort. The hardiness of the species, especially the king eiders, certainly added to the success.